People who pick partners with a similar personality to themselves could be helping to guarantee matrimonial bliss. When dealing with the day-to-day stresses of life, opposites do not attract, US scientists say. 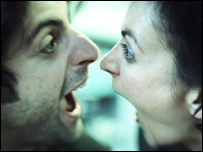 Personality clashes make for more rows, even if the couples initially had the same values, they say in the Journal of Personality and Social Psychology. The University of Iowa team studied 291 newlyweds who had been dating for around three-and-a-half years. Generally, the couples were similarly matched in terms of attitudes and beliefs. The researchers then looked at personality traits such as attachment, whether they were extravert or introverted, and whether or not they were conscientious. The couples were then asked to rate how happy their marriage was. When the researchers compared these ratings with the various personality measures, they found a trend. The happier couples were the ones who were more similarly matched. Psychologist Eva Klohnen, who conducted the research, said it was likely that people were initially attracted to those with similar attitudes and beliefs. Given that attitudes and values can be judged fairly early on in a relationship, couples with differences can chose whether to stay together despite or because of these differences. Personality-related characteristics, however, take much longer to be known and do not play a more substantial role until later in the relationship, she said. "Being in a committed relationship entails regular interaction and requires extensive co-ordination in dealing with tasks, issues and problems of daily living. "Whereas personality similarity is likely to facilitate this process, personality differences may result in more friction and conflict in daily life," she said. Dr Christopher Armitage, reader in psychology at Sheffield University, said: "This fits in with a great deal of research on relationships. "People have these beliefs that birds of a feather flock together and research backs this up." Christine Northam, a senior Relate counsellor, said it was important for couples to have enough common ground to make relationships stick and create intimacy. She said conflict could arise when personalities clashed. "For example, if one of you always did what you said you would and the other said they would but never did, that would cause conflict." But she said it was very complex because attitudes and personality are intimately linked. "Being conscientious, for example, is about your values and what you think is important." But she said opposites could attract and work in some cases. "You can get these complementary relationships where one of you is the life and soul of the party and the other one is quite happy to sit back and enjoy themselves. "But when it's too polarised, that can cause problems."